Join us on Friday 19th April between 12pm and 4pm to take part in our FREE Easter Hunt to find the missing eggs & win a chocolatey treat! Pick up your agent ID form from the det-egg-tive station, grab your bunny ears and magnifying glass and head out on the hunt with our Egg-cellent agent. Solve the clues and the Easter bunny will appear with treats! 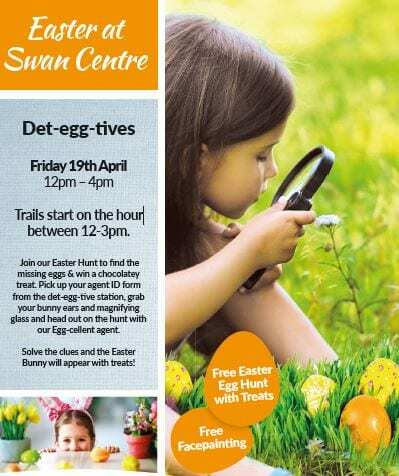 Swan Shopping Centre Easter Event Det-egg-tives trails start on the hour between 12pm-3pm. PLUS, there will also be FREE face painting to transform your little chicks into their favourite Easter characters.